The JCCS is coming up 28th of September at the Queen Mary in Long Beach. 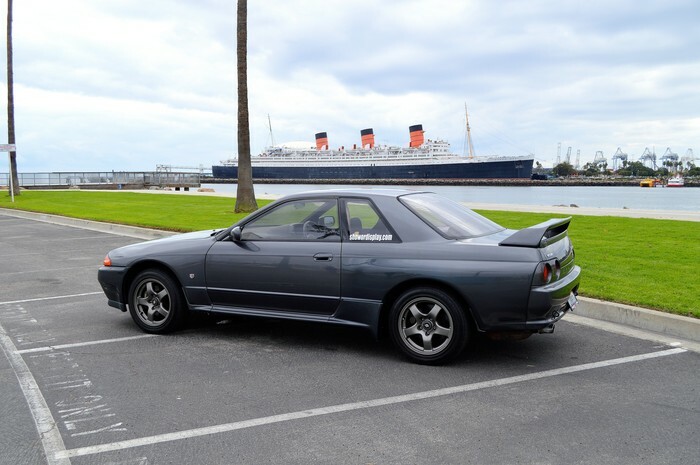 The ShoworDisplay Nismo R32 GT-R will be at the show, and we will be there answering any questions you have about importing vehicles that are over 25 years old, Show or Display, and any other importing or exporting questions you have. The 9th Annual Japanese Classic Car Show will be held 9am-3pm on Saturday, September 28, 2013, along side the Queen Mary in Long Beach, CA. In Japan, the number nine is pronounced "Ku"; the number is linked to hardships, or "kurou". The truth is, JCCS could not exist without tales of hardship. Anyone who has worked to put an old car together will know it's not easy. Finding cars. Finding parts. Making those parts fit. Getting everything running, on budget and on time. Even making it to the event--people come from far and wide, traveling hundreds of miles (and even across an ocean) to share in the annual kyu-sha celebration that is JCCS. Sacrifices must be made, always. Yet at the same time, the tougher the struggle, the sweeter the celebration. Our goal is to make the 9th JCCS the sweetest event yet for all who attend. Also, the number 9 has a degree of finality to it--it means "the last." But it does not mean the end ... the number 9 is seen as the final stage to achieve before moving on to the next step, the next level. (Witness the Datsun Maxima, known as the Bluebird 910 ... it was the Bluebird generation used as a stepping stone to the ultra-luxury Maxima--a name and a concept of sporting luxury that continues even today. Or the Honda Coupe 9, which never made it Stateside but was a final evolution of its automotive vision at home, before Honda decided to export cars to America.) Next year will be JCCS' 10th anniversary--a milestone--but this year we're going to party like it's JCCS Number Nine. We remain grateful for the opportunity to show the world that Japanese cars and classic cars need not be mutually exclusive; with dedication and perseverance, the idea has taken hold. We are very happy to welcome our newest auto manufacturer sponsor, American Honda. This is significant for several reasons. First, the popularity of Honda cars has been increasing rapidly in the last couple of years at JCCS. 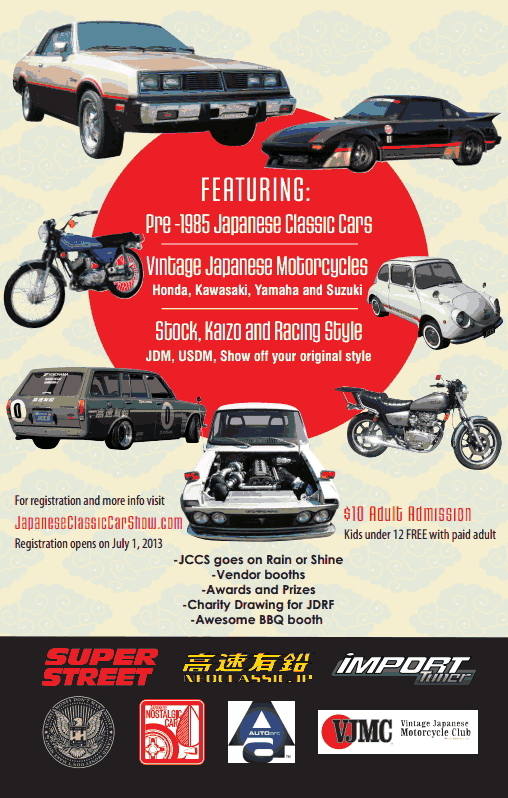 More owners are bringing out their restored or original Honda cars for the crowd to enjoy, and with Honda's participation, we can only expect this enthusiasm to increase. Second, and just as importantly, Honda is the only company that manufactures and imports both cars and motorcycles; indeed, Honda started as a bike company, and moved into cars in the early 1960s. The first Honda cars officially came to the US in 1970. Though they are relative newcomers compared to some other manufacturers, their cars quickly became the vehicles of a generation, leaving a deep and lasting impact on their owners--and the young passengers in back, many of whom have warm memories. We look forward to collaborating with American Honda, in order to show their rich and continuing history in the American market, on both two wheels and four. They join Toyota's and Mazda's continuing manufacturer-level support of JCCS. Everyone here at JCCS looks forward to seeing you at the Queen Merry.